This item sold on December 23, 2017. Astrid is going to Otter Space! This little otter has her helmet and backpack and is ready for a science adventure. 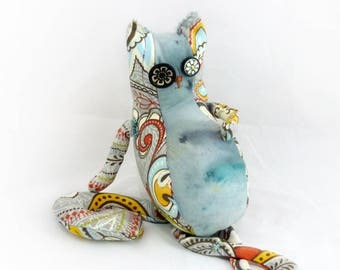 She's made from a super vivid tie-dyed velvety corduroy type fabric, and her belly is a unique quilted textile created from layers of sheer fabrics with silver star-like sparklies and a looping pink stitch. She's got a very expressive hand-stitched face with a lil faux leather nose, tiny button eyes, and sweet wee ears. All four paws are weighted and beanie. Her little otter body is sturdy and firm. She owes her great posture to a tightly packed "body pod" core made of tiny scraps of fabric that would otherwise end up in a landfill. She's got a layer of polyfil in there too to keep her squishy and squeezy. She stands up pretty well on her own, and has a removable papier mache helmet and backpack. Her equipment is made from junk mail envelopes, and some printing is visible on the surface, all very charming. She's not tiny, but she is smol. She's about 12" (30 cm) tall, but she's heavy enough to be a functional (if not practical) paperweight. Spot clean only. Though the button eyes are securely sewn, Astrid may still not be a suitable companion for very, very young chewy bitey types, and her delicate belly fabrics may be more susceptible to showing wear. This listing is for one otter, with papier mache helmet and backpack. Rocks, planets, and moons not included. Some photoshopping was involved in certain photos. 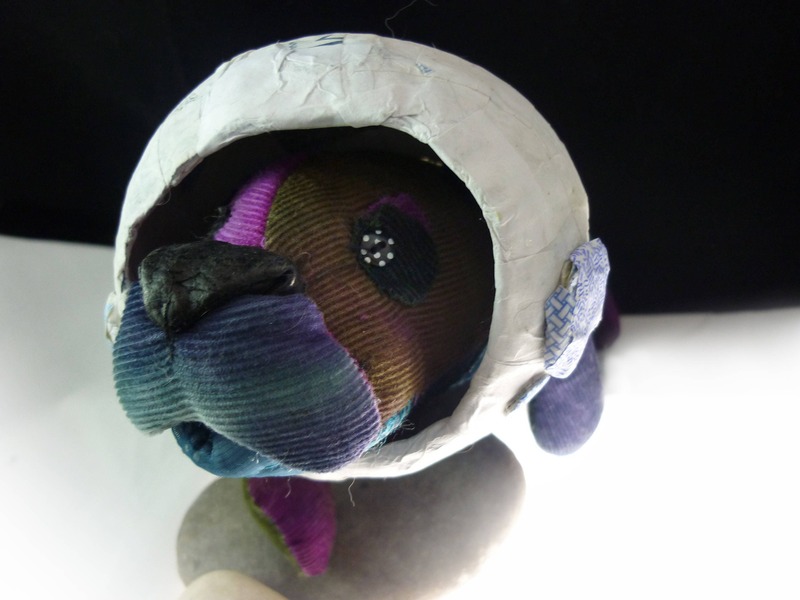 Custom stuffed animal handmade to order: cat, otter, sloth, owl + more! I was looking for a unique and whimsical gift for my Girlfriend for Christmas, and Astrid more than fit that bill. Her personality and artisanship was marvelled at by all that met her and my Girlfriend was immediately in love with Astrid. Thanks Angie for bringing these amazing creatures to life!!! This item is amazing. We have a collection of sloths and have named this one Brunhilda. Perfect addition to our sloth family. Love her! She likes to travel from room to room to mother the other sloths. Nogbert the owl exudes personality and character. Completely charming with wonderfully whimsical details. Quick shipping. I ship to the address on file with Etsy. Please confirm your address at the time of check out. I ship all orders via USPS unless otherwise arranged. Tracking notices are emailed when the package ships so you can track your package online. If you are in a rush please make me aware of your timeline when your order is placed. If you have ordered a custom piece that is being made specifically for you, please allow at least 2-3 weeks for production. More time may be needed depending on the season and your order. Please message me for details on production times. I'm happy to hear from you and usually respond quickly. Payment is due at the time of purchase. If paying by e-check, shipments will not be shipped until the e-check clears. In the case of non-payment I will cancel the sale. In the rare case that your item arrives damaged, I will refund your money upon return of the item, all shipping costs on me. All work is copyright © Angie Brown. If you wish to use any of my photographs, please contact me for permission. With every image used, credit must be given as well as a link back to my shop.